We eat a lot of CFS down here in Texas, for breakfast, lunch and dinner. I've been trying to think if I've ever encountered it offered as a sandwich and I can't remember one. The choices usually involve a decision about how much of it you want to lop over the edge of the plate or whether you want steak fingers. I guess they do things a little differently up there. I have seen, and tried, fried pork chop sandwiches, at soul food or Cajun places, often bone-in. I would have picked the El Reno Onion Burger for Oklahoma. And would have picked the New Orleans Po-boy over the Muff. There are a lot of choices for Muffs here but are they really that well known/available outside of a limited area of the South? Sad to say, the Chopped Beef BBQ sandwich is probably a good choice for Texas. I think it's the worst way to experience Texas BBQ but everybody serves 'em, unless they just don't do sandwiches at a particular joint. Weekends and sometimes weekday evenings, the sight of people towing pits around behind SUVs or pickups, pulling into the parking lot of a grocery store, Best Buy, Academy Sports and Outdoors, etc., for just a few minutes, is very common. They may offer links or even plates but overwhelmingly what people go for is the chopped beef sandwich, slathered in sauce. Onion burgers for Oklahoma sounds right. I’ve been thinking about this and it seems the problem is most sandwiches are associated with a City for the most part, and not a State, especially States with more than one big city. Still lots of fun. Can't agree with the loose meat sandwich being Iowa's iconic sandwich.....I don't know anybody under the age of 65 who eats those. (full disclaimer----as a transplant from Chicago, maybe I just don't "get it"). Or, maybe it's a lot more popular in small towns than here in the Des Moines area. I think there's maybe 4-5 places in the entire metro that serve these sandwiches. Breaded pork tenderloin would be by pick. In the media here, I'll see mentions of some group naming some place the best tenderloin in the state, or best BBQ in the state or best hamburger in the state.....never seen any awards for best loose meat sandwich. Yes, I agree to you. The sandwich is pretty good over there. That's quite a coincidence. We are flying into OKC for the weekend and I was thinking about stopping in at a Del Rancho. That's a good looking sandwich! I haven't been to one in quite a while. The one here in Guthrie closed several years ago. The only one I have been to is in Moore. My favorite thing about the place is that each booth had a telephone and you call your order into the kitchen. I went to the one near NW 50th and MacArthur about three years ago . It's just a drive-in with no indoor dining area (it's an old Sonic I think). The food was still good, although I admit I usually get the CFS dinner and not the sandwich since I like it with mashed potatoes and fried okra! Edit: I'm sure you already have plans but if you're looking for beef ribs there are two places in Edmond doing them on weekends (although I'd call ahead to make sure): Deckle Smokehouse and Texlahoma Bbq. Was that a CFS sandwich in the commercial? If so, I'd definitely eat there! Pastrami & rye for New York? What state doesn't have P&R? So how can it be iconic? THE iconic New York sandwich is clearly Beef on Weck found in Western NY. IIRC I've seen the LMS fairly often in smaller towns so you may be on to something there. I'll have to pay particular attention when I'm next in the state. When I lived in the not yet trendy WDM in the mid 90's, I didn't get the LMS either...but then I'm originally a Mainiac. The popular sandwich was the BPT and many places did a Grilled Pork Tenderloin, which I also loved. Man, has that area exploded. Texas: (1) Cheeseburger. (2) Chopped beef sandwich. Every state could be cheeseburgers 🍔, but why do y’all insist on chopping up perfectly fine beef into something one doesn’t even need teeth to eat? Because like everything else in life, because you like it!!! Low blow. Ouch. I may live in trendy WDM, but I have lived here since long before it was trendy and I am in the decidedly non-trendy part of town. Other than an occasional trip to Five Guys, I almost never eat anywhere near Jordan Creek. Much more likely to head to downtown DSM or the Ingersoll area. And never a loose meat sandwich anywhere in sight. At least they got Illinois right. we enjoyed at the Moore location of Del Rancho. Not overly wide or thick, the flavor was spot on. No knife necessary, as this rugged crusted beauty cut easily with a fork. I was surprised that there was no gravy on top, but maybe that is a good thing as it prevents any sogginess. I am far from a CFS expert, but we thought this was outstanding! It is so great to find a really good cfs. The ones I've had occasion to eat have ranged from really good to 'I broke my knife'! The very toughest piece of meat I've had was a chicken fried steak at a restaurant known for it' hamburgers and fries. I should have settled for what they do best. I ate it but I had to pick it up and pull! That's a good-looking CFS, BB...were the potatoes the real thing, too? When Mrs. C and I returned from AZ last spring we drove through OKC, but at the time I wasn't aware of Del Rancho. If I had been there's a good chance we might've stopped at one. 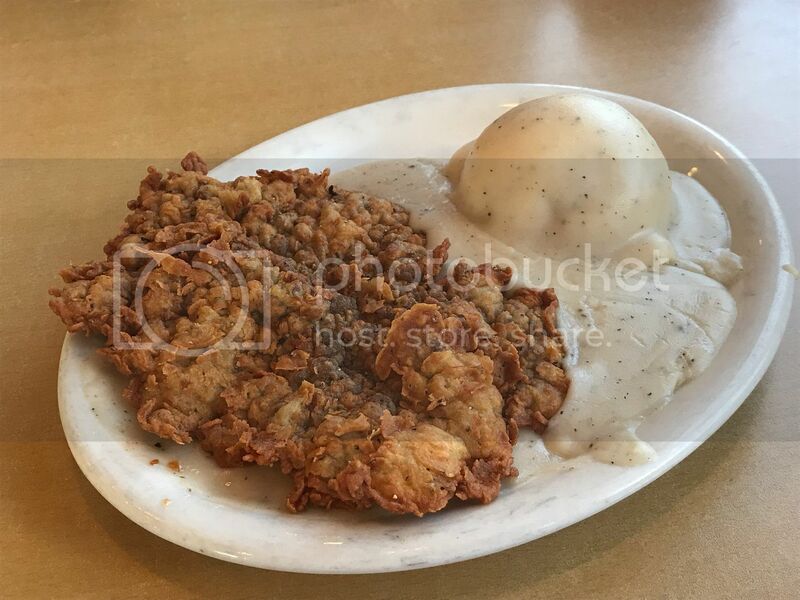 Yes, those were real mashed potatoes. Excellent thick, creamy gravy, too. The one thing I did not like was the overwhelmingly sweet cherry limeade. Yeah that's a good looking CFS! I remember now that putting the gravy under the steak is kind of their "thing". For a good limeade one must go to a Braum's!